Dessert pizzas are as much fun to make as they are to eat. My sisters and I had a lot of fun putting this one together and there weren’t any leftovers at the end of the night. 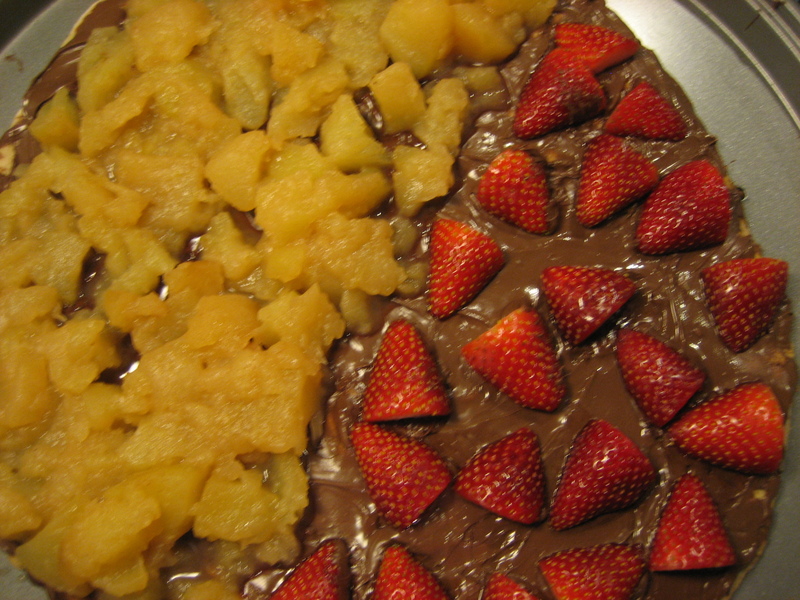 Apple and strawberry dessert pizza is perfect if you are looking for a quick and easy pizza pizza to make with kids. The pizza has a lot of sugar, but it is a delicious treat! Mixed berry pizza is a perfect pizza idea for Valentine’s Day, but the red, white, and blue colors make it equally appropriate for a Fourth of July pizza. I prebaked my regular homemade pizza dough for 4 minutes and then spread on ricotta cheese mixed with a little sugar as the base. 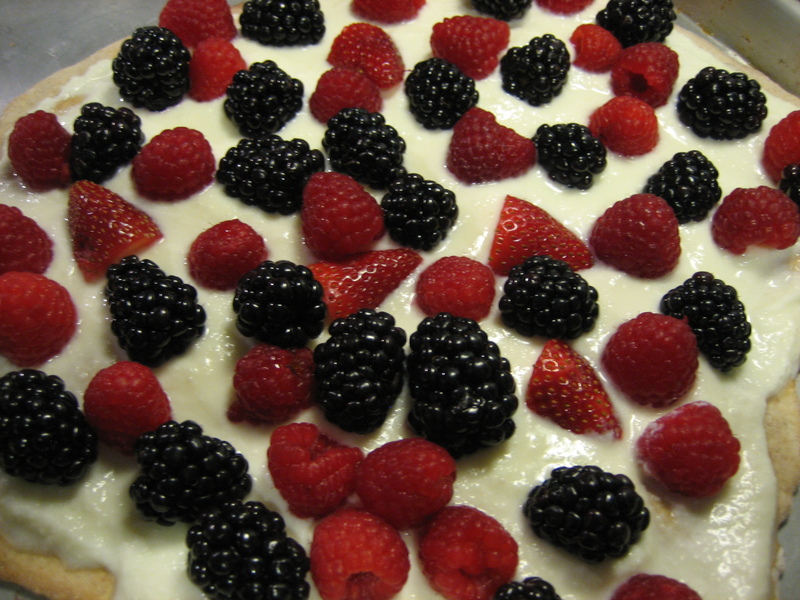 Then I topped the pizza with raspberries, blackberries, and strawberries. My mixed berry pizza is a fun pizza to make as a family. If you are looking for a pizza to make with your kids, they will have no trouble spreading on the ricotta or topping the pizza with berries. This is the second fruit pizza I’ve created and I’m certain I’ll create more in the future. February is heart health month so today’s pizza is a healthy one. 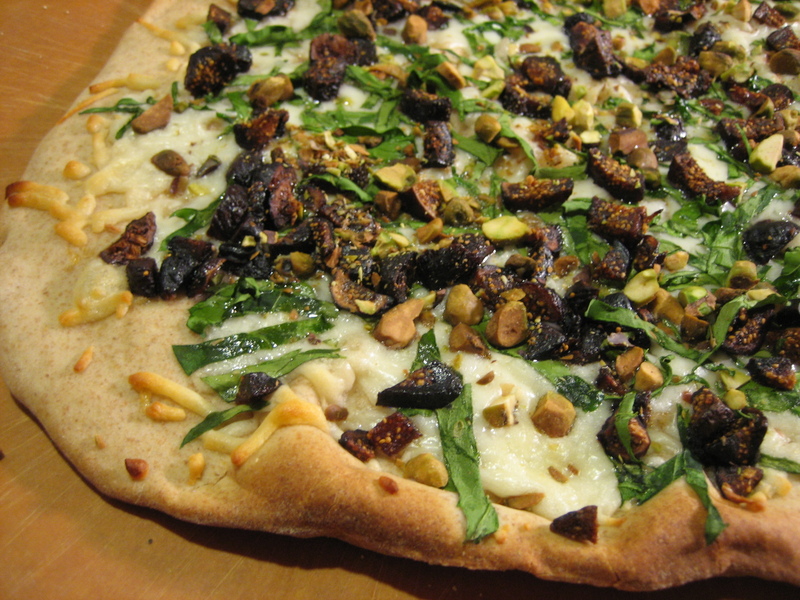 This pizza includes two ingredients I have not used before: figs and pistachios. First, I ate my share of Fig Newtons when I was a kid, but have never been much of a fig person. The health benefits of figs are undeniable; they are high in fiber and full of iron. Second, pistachios, which help lower cholesterol and control blood sugar are great on salad, but they are an ingredient I had never considered putting on a pizza before today. To add to the health benefits of this pizza, I also included spinach, which has flavonoids and carotene that protects against some cancers. Here’s how I created this pizza. I started by spreading a mixture of sauteed shallots and olive oil on my homemade pre-baked pizza crust. Then, I sprinkled on mozzarella cheese and chopped spinach, pistachios and figs before baking it on my pizza stone for 10 minutes at 500 degrees. I thought the figs might be too sweet, but this pizza turned out nicely. This was a vegetarian pizza that even a meat lover would enjoy. It was light, but packed full of flavor. Lastly, and it’s just a small thing, but I like the way I chopped the spinach in small strips for this pizza and will use this method when I make pizza with spinach in the future. Do you have a standby recipe for nights when you don’t like to cook? One of my standbys is layer dip. Individually the ingredients aren’t that bad for you and together they taste so good. I was curious to see what layer dip might be like on pizza so I gave it a shot this week and have to say that my guacamole pizza is one of the most dense and filling pizzas I’ve made. I was surprised that I was able to recognize all the distinct flavors after baking the pizza. It tasted like layer dip with a crispy, chip-like crust. While pre-baking the dough, I prepared the guacamole by combining one avocado with store bought guacamole mix. Then, I used my potato masher to smash a can of pinto beans and mixed the beans with taco seasoning. To assemble the pizza I spread a thin layer of the smashed pinto beans on the dough, followed by a thick layer guacamole. Then I added a layer of salsa and cheddar cheese. Finally, I topped the pizza with a few chopped onions and sliced black olives. 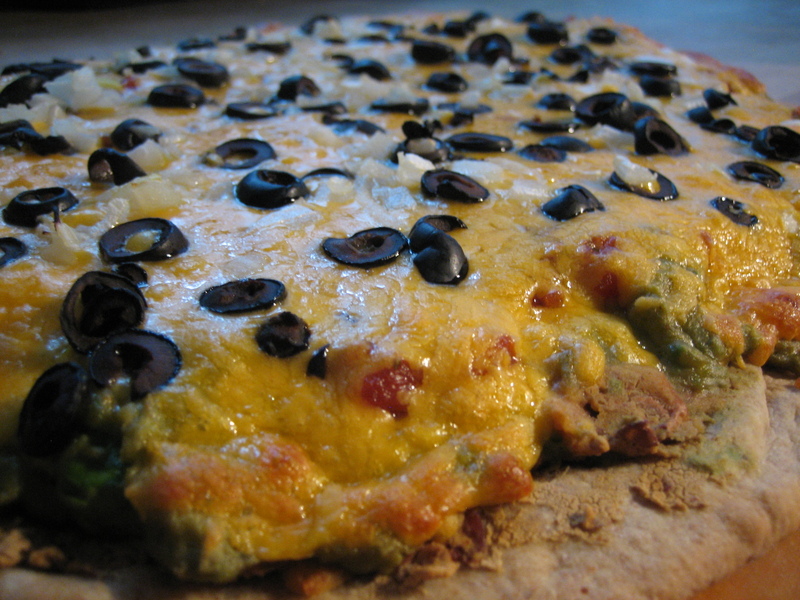 I’m thinking Guacamole pizza might give layer a dip a run for the money at our Super Bowl party this year. Pork chop pizza is fairly unique on its own, but using apple sauce as a base makes this pizza pretty special. I thought the apple sauce might make the dough soggy, but the crust remained light and crispy. The apple sauce stayed sweet and tart and complemented the pork chop and caramelized onions so well. I started by caramelizing the onions in pan over medium heat. Then I seasoned a pork chop with salt and pepper and grilled it on my George Foreman Grill . To assemble the pizza I spread a generous portion of Santa Cruz Organic Apple Apricot Sauce across the pre-baked dough. Next, I sprinkled mozzarella cheese over the apple sauce. 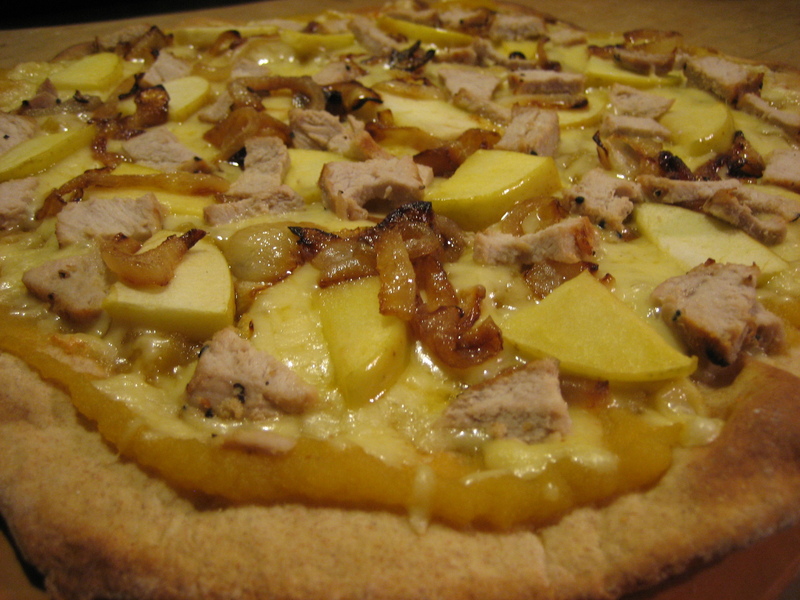 Finally, I topped the pizza with a sliced golden delicious apple, caramelized onions, and the pork chop. If I make this pizza again I think I’ll use a cheese with more flavor – perhaps Swiss cheese. The menu for the day after Thanksgiving usually includes a turkey sandwich for lunch and turkey casserole or turkey soup for dinner. But this year I decided to forgo the traditional recipes and turn the leftovers from one of my favorite meals of the year into a pizza. Our Thanksgiving day leftovers included mashed potatoes, stuffing, corn, roasted vegetables, and turkey. I pre-baked my dough and then spread on a layer of mashed potatoes. Then I added the stuffing, corn, and mixed vegetables. Next, I cut the turkey into small pieces and arranged it on top. I put the pizza back in the oven for 10 minutes, removed it, and then drizzled on some warm gravy. Special credit goes to my mother-in-law who cooked this wonderful Thanksgiving meal and gave me the leftovers. My day after Thanksgiving pizza was like having Thanksgiving dinner all over again. The turkey remained moist, the flavors from the apple in the stuffing popped, and the veggies were just right. 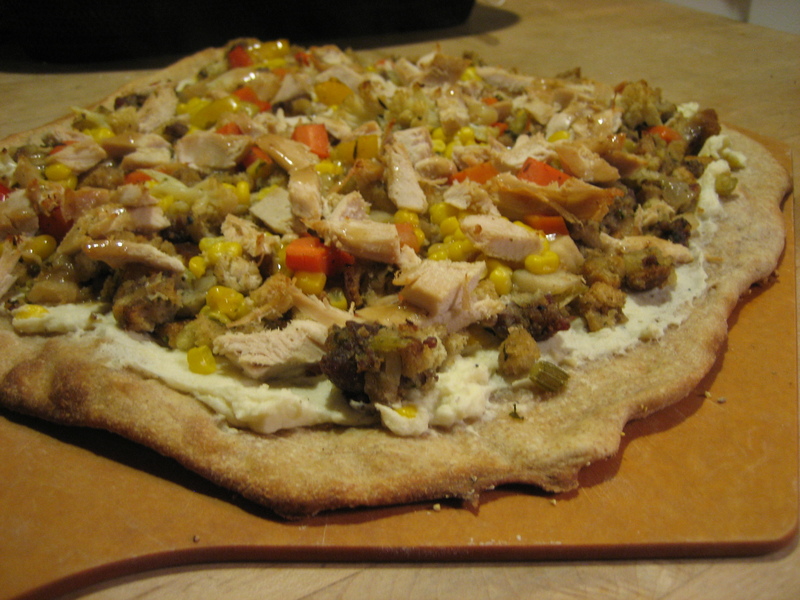 I hope my Thanksigiving pizza recipe becomes an annual tradition. Autumn is a season full of wonderful flavors. I especially love all foods that include apples. Last year I topped two different pizzas with apples. Both were good, but I wanted to try something different. Now that I have successfully caramelized onions a couple of times, I decided to make them for this pizza. Along with the onions, I sauteed a Granny Smith apple and crisped bacon in the toaster oven. After pre-baking the dough, I sprinkled on cheddar cheese, then added the onions, apple and bacon. I let it bake until the cheese started to bubble. The only things wrong with this pizza was that it was too small. It was so good! The cheddar cheese tasted amazing with the caramelized onions and apples. And bacon, it’s so good with anything. 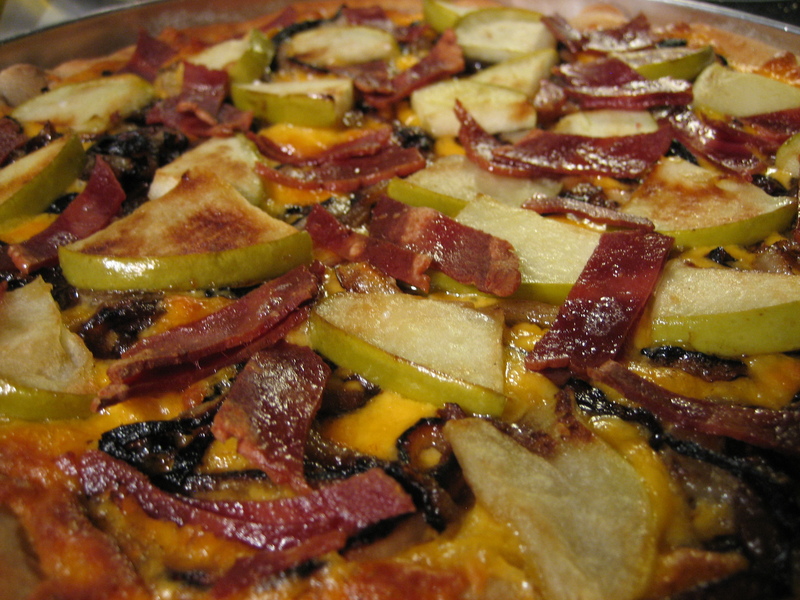 My apple, bacon and caramelized onion pizza recipe was a perfect fall dish!